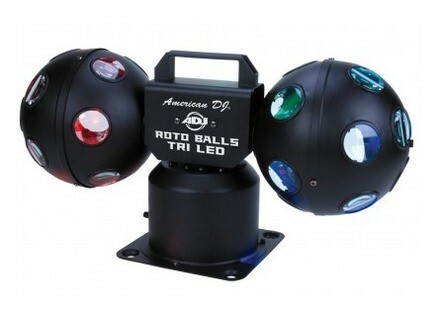 Rotoballs TRI LED, DMX Effect from ADJ (American DJ). 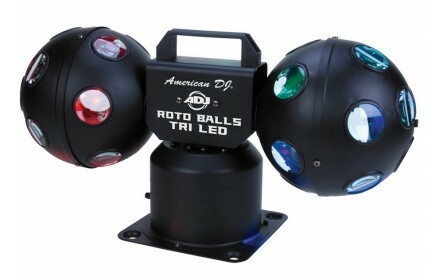 American DJ presents a couple of new halogen effects, the Rotoballs TRI LED and the Mini TRI Ball. Rotoballs TRI LED — A centerpiece effect, the Rotoballs TRI LED features dual rotating balls equipped with 4 3W 3-in-1 Tri-color LEDs. It covers a wide area with 60 sound-activated beams that change colors and strobe to the beat of the music. For added versatility, it features a variable speed knob that lets users adjust the velocity of rotation, which is variable up to 35 RPM. Rotoballs TRI LED has a power consumption of 18W per unit, and it offers multi-voltage operation for added flexibility (AC 100V-240V @ 50/60Hz). The dual-headed fixture measures 22" x 9" x 11.5" and weighs 11 lbs. Mini TRI Ball — A small rotating and strobing fixture, the Mini TRI Ball creates a mirrorball-type effect — similar to previous models in the American DJ line but with the added benefit of 2 powerful 3W TRI Color LEDs, the company says. Featuring a wide beam angle of 180 degrees, it produces 56 beams that change color, spin and flash to the beat of the music at variable speed up to 15 RPM. A 3-position FX switch lets user easily set the Mini TRI Ball for constant rotation, no rotation (static) or sound active rotation. Drawing 13W of power, this unit measures 7.75" x 7.75" x 6" and weighs 4 lbs. For a video demo, check out www.youtube.com/watch?v=Uo6s-2eiKwc. For more information, visit www.americandj.com. American DJ Theatrix Pro 48 LED The new Theatrix Pro 48 LED is a DMX-compatible RGBW wash bar contains the typical red, green and blue LEDs, as well as white LEDs. GlacialLight LED Spotlight Range GlacialTech is launching a new range of LED spotlights described as "green". American DJ Pinspot LED BP American DJ introduced a 3W white LED version of the Pinspot DJ/club/display effect.